Just 17 days to go! Baltimore is buzzing with excitement as Labor Day weekend quickly approaches and with it the 2011 Inaugural Baltimore Grand Prix! The grand stands have been erected, race walls are going up and the city streets indeed look like the race course they will become on September 2nd. Restaurants, bars, nightclubs and attractions are rolling out the red carpet with checkered flag specials and themed events during Baltimore Race Week (Aug. 28 – Sept. 4) for the 100,000+ visitors expected to flood the city for Indy car racing at it’s finest. 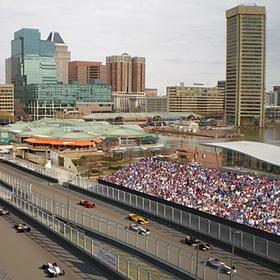 From Baltimore Grand Prix-fixed menus at local restaurants, to happy hour specials, free and discounted admission at various family-friendly attractions, and free concerts and events in the Inner Harbor and Harbor East areas, the jam-packed week promises race fans and unforgettable Charm City experience. Click here for Baltimore Race Week events and specials. Situated on the outskirts of the race course and within an easy walk of all the action, 1840s Carrollton Inn is the perfect spot to spend Baltimore Grand Prix weekend. Rooms and suites are unique and charming, treating guests to a true and authentic Baltimore experience. All accommodations include a full gourmet breakfast served from a menu each morning… so fill your tank before a busy and exciting day on the town! The inn is footsteps from Little Italy, the Inner Harbor and Harbor East. With a Charm City Circulator stop just outside the main entrance, Baltimore’s free, eco-friendly transportation is the perfect alternative for getting around on this busy weekend. Rooms and suites are still available but won’t be for long! Click here for reservations.